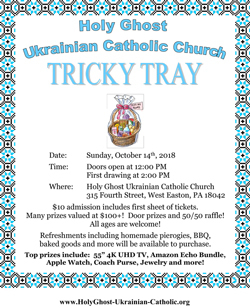 The annual Tricky Tray will be held on Sunday, October 14, 2018 in the Holy Ghost Church Hall with the doors opening at 12:00 PM (30 minutes earlier than advertised). The Tricky Tray drawing will begin at 2 PM. Admission is $10 which gives you a sheet of Tricky Tray Prize tickets (25 tickets per sheet) and a door prize ticket. 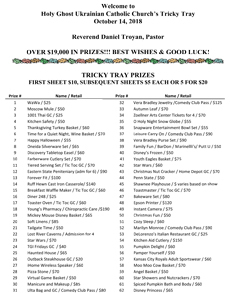 Click on the picture of the Tricky Tray flyer below to download and view. The Tricky Tray program for 2018 is now available to download, view or print. A hardcopy will also be provided with admission. Click on image below to download. Fifteen fabulous Grand Prizes are available to win -- including a 55-inch Ultra High Definition Smart TV, Apple Watch, Amazon Echo Bundle, jewelry and more! These items typically retail between $100 - $500+ and will have a separate drawing with 7 tickets for $10. Well over 125 Tricky Tray items will be available to win for all ages with retail prices with a minimum of $50 per prize. Additional sheets of tickets are available for $5 for 1 sheet or $20 for 5 sheets. Thank you for visiting our website. We hope you can attend our 2018 Tricky Tray and spend an enjoyable afternoon with us. Please tell your friends and family!! There will be a great variety of prizes for all ages!! !